For all the talk about patenting for startups and spin-offs, people often forget that there is a step that predates this discussion: Solving the Fundamental Technical Problem. Early stage research presents a challenge with respect to patenting: Balancing the trade-off between the competing forces of ensuring protection of the final technical direction against the patent rules of filing early enough to gain that protection, and more critically, filing with enough quality content to create a robust patent. Many early stage researchers realize IP is an important tool for protection on their forthcoming technology however because of the timing and stage of the research are not able to find the balance in this trade-off. Often rooted in academia or driven from industry needs, early stage technical research addresses specific technical challenges that have potential for future large commercial impact. These technical projects often focus on applied research to validate a technical direction, and then ultimately moving that technical direction into an innovative, market ready product and an associated spin-off company. Early Stage Research in practice: In the early days Bell Labs often considered how the capacity of telephone and switching traffic would need to change as it became more complex. In The Idea Factory: Bell Labs and The Great Age of American Innovation, Jon Gertner discusses how Bell Labs looked ahead, beyond what was technically possible, and considered where the research had to develop. Their driver to address the burdens todays technology will create for businesses tomorrow and as a result were instrumental in many key technological advances such as the transistors, solar cells, the laser and the first single chip DSP. To overcome this challenge we must first think about the entire R&D cycle, starting at the point where the technological research begins and finishing where the product is usually released to market. We can do this by categorizing the research into three stages: starting at Early Stage Research, moving to Validated R&D, and finishing with MVP to Product Release. Stage 1 – Early Stage Research: In Stage 1 most research may be technology driven, not necessarily market need based. Researchers often realize there is a technological or economic challenge that needs seminal discoveries to meet the challenge. This early stage research shares the characteristics of having multiple directions to go, with the uncertainty of what the final technology direction will be. Stage 2 – Validated Research & Development: In Stage 2 much of the technology plan and direction has been validated. With a business mission and vision in place the beginning of a new venture or spin-off company can be formed. 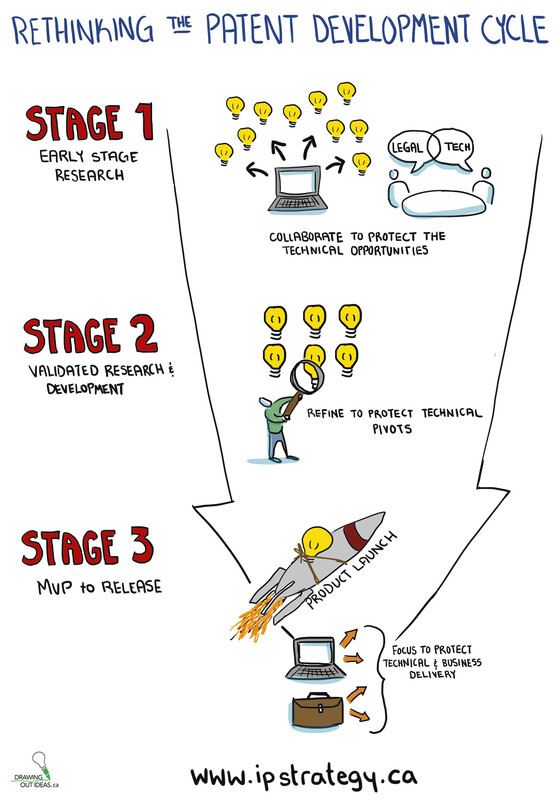 Stage 3 – MVP to Release: In Stage 3 the market opportunity is defined and the Minimum Viable Product is ready to release. Market-ready technology is seen through customer validation or product launch. Considering the long term business view of protecting technological research, taking a Staged Portfolio approach to building patent coverage allows for the flexibility to grow and evolve the footprint over the development timeline. The goal is to create a wide and broad portfolio and continue to narrow and refine the coverage over time. This generates early patent coverage for key technological breakthroughs which gives the opportunity for core patent protection for both the final product and in the industry. Looking at the Staged Portfolio view illustrates the portfolio growth difference when comparing it to the Convention Portfolio, which is where most IP is secured. 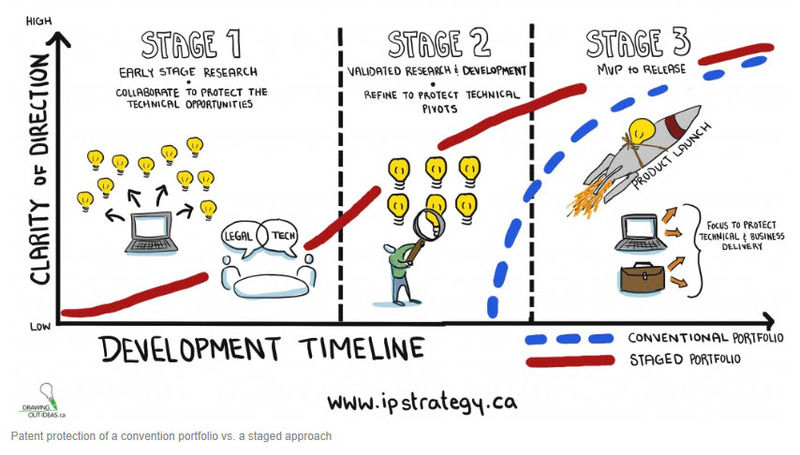 Stage 1 – Early Stage Research: Characteristics of the patents filed at this stage are a wide technology scope, driven to cover the technical trends and results. Collaboration between the legal and technology teams are critical to ensure Sound Prediction and Enablement requirements for the patent office are met. There is an expectation that not all patents filed will be kept as there is still uncertainty of the final market-ready product, so cost filing strategies should be considered, such as provisional applications and PCT filings. Stage 2 – Validated R&D: Characteristics of the patents filed are also wide in technology scope, but focused to have technical depth around the validated technology direction. The breadth is seen where coverage for technical pivots are protected as well. Taking the business value and spin-off direction into consideration will provide direction for legal counsel to seek protection. Again collaboration between the legal and business groups are essential: without a clear view of the business plan and technology direction, the legal view that is driven by reducing risk by ensuring robust patents on the specific technology are granted may not always align with the long term needs of the business. The ultimate goal for the collaboration is to create IP that has a wide enough footprint to allow for coverage if redesign or adjustment of the end-use product is required. This model also ensures at enough coverage to account for adjustments by competitors as the new product is released. Stage 3 – MVP to Release: This patent protection is the typical filings by startups. With business and technology direction defined, products are released and the coverage reflects as such. Building a Staged Portfolio has the same risk of funding innovation at an early stage and as such the balance of risk vs. reward must be considered in applying this approach. Risk is seen in both cost outlay, as well as potentially creation of prior art for the invention if the development cycle is long. Balance considerations include licensing program expectations for IP not commercialized, ability to perform work under a NDA and maintain IP rights, and position of the competition and their speed to market. Rewards include deep and early protection of potentially disruptive technologies as they evolve into the market. Very few companies succeed in creating such a wide footprint of protection from inception of the technological developments. Realistically there are cost pressures, resource constraints and a general apprehension of applying such fixed resources towards protecting an uncertain end-game. However, when the portfolio coverage is considered as a whole it provides a viable patent strategy for technologies in their early development stage.